Last modified on August 15th, 2018 by Vincy. Facebook supports PNG, JPEG, BMP, GIF and TIFF format photos for uploading to a post or Facebook page. Facebook supports publishing single or multi-photo stories using Facebook API. 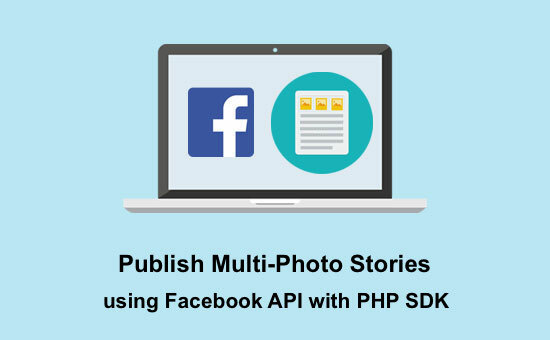 I have used Facebook PHP SDK for publishing the multi-photo stories in this tutorial. The implementation will be as simple as that programming with Facebook API to get user feeds and photos. The multi-photo story can be published on the Facebook by using the photo and feed endpoint. Following are the steps to implement this. Create a Facebook App and get the API key and the app secret key. Integrate Facebook Login and get the access token for accessing Facebook API for performing photo upload and publishing post. Create an interface to upload multiple photos. 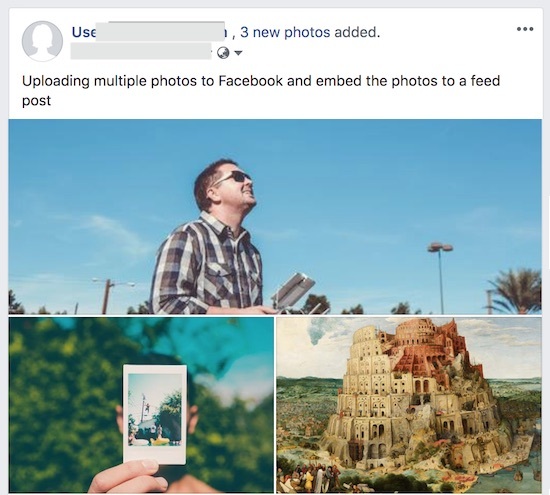 Iterate the uploaded images and post to Facebook Photo edge with publish: false. Get the photo ids array response from Facebook and refer the id to embed multiple photos to a feed post. Go through the above-linked articles to learn about how to integrate Facebook login and to get the Facebook API key and secret key. For publishing a multi-photo story to the Facebook, the photo files have to be uploaded first. While uploading the photo for a story feed, we have to send the boolean parameter published with the value false. By setting this parameter, the photo will be uploaded to the Facebook server but not published on the photo endpoint. Following is the HTML code with the multi-photo upload option. I made the markup as simple as possible for supporting the multi-file upload by using the “multiple” attribute. This form also contains a textarea to enter the text for the Facebook post. By submitting the story text with the uploaded photo files, the PHP code will handle PHP image upload and also the Facebook API access via SDK functions. On each photo upload, the post request will get the id of the uploaded photo. These ids are loaded into a PHP array and will be embedded on the story feed later. This is the PHP code for uploading multiple photos to the specified target. The chosen files array is iterated and the files will be moved to the target folder. The uploaded file locations are sent to a PHP function which handles the Facebook API photo upload process by using PHP SDK. This code snippet is the part of the PHP FBUserPhoto class file that handles the multi-photo upload. In the uploadPhoto() function stated above, the Facebook photo post request returns the uploaded photo id. While uploading multiple photos to the Facebook server, the returned ids are stored in a PHP array. This photo id array will be iterated in a loop to embed them into to a story feed. This code shows how to embed the uploaded Facebook photos to a feed post by using attached_media parameter. This parameter should contain the array of photo ids by using the media_fbid key. This is the screenshot with the Facebook output of publishing multiple photo story.